Central Valley water districts were only allotted 65 percent of their rated annual quota three weeks ago, and just 5 percent this time last year. But with the 5-years of drought turning into the northern Sierra’s all-time peak water year since the BLM began keeping records in 1921, the agency is desperately pushing water south. The Sacramento regional office of the National Weather Service told Breitbart News that their eight-station Northern Pacific Precipitation Index hit another record of 90.90 inches early on April 17, 2.4 inches higher than the previous record. With the Weather Channel predicting a 70 percent chance of cold thunderstorms in the valleys turning to snow at the 3,000-foot level, the snow pack rise from the near-record 185 percent of average for this time of year. But the real risk for the BLM is the massive snowmelt expected this weekend as cool 59-degrees temperatures at the North State’s Shasta, Trinity and Oroville dams, flip to blazingly-hot 80-degree temperatures this weekend. Central Valley water districts were being allotted only 65 percent of their rated annual quota three weeks ago, and just 5 percent this time last year. But with the 5-years of drought turning into the northern Sierra’s all-time peak water year since the BLM began keeping records in 1921, the agency is vigorously pushing water south. The Sacramento regional office of the National Weather Service told Breitbart News that their eight-station Northern Pacific Precipitation Index hit another record of 90.90 inches early on April 17, 2.4 inches higher than the previous record. The Weather Channel predicts 70 percent chance of cold rain and snow for the next two days cold thunderstorms in the valleys turning to snow at the 3,000-foot level. That will push the snowpack past the near-record 185 percent of average for this time of year. But the real risk for the BLM is the massive snowmelt expected this weekend as cool 59-degrees temperatures at the North State’s Shasta, Trinity and Oroville dams, flip to blazingly hot 80-degree temperatures over the coming weekend. The 4.6-million acre feet capacity Lake Shasta is already 96 full and the water level is at 1061.06 feet, just 5.94 feet from unrestricted flow over the dams spillway. The BLM has stabilized the water situation by blowing 25,000 cubic feet of water per second through the 18 giant outlet pipes on the face of the dam. Federal operators have the capability to turn that volume up to 81,000 cubic feet of water per second, but anything over 40,000 cubic feet would cause heavy flooding down the Sacramento River. 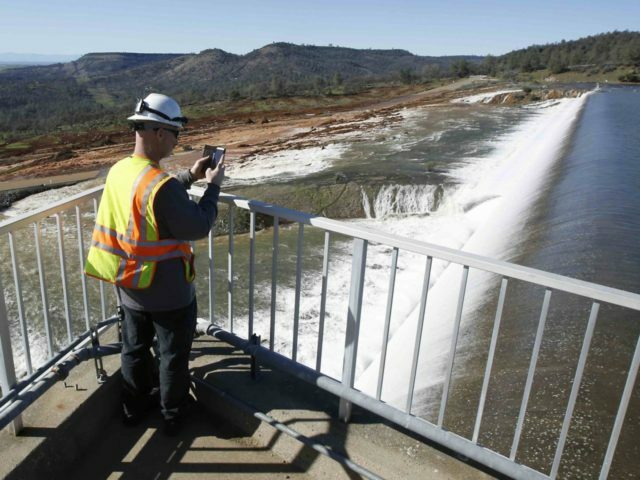 By running the fractured Oroville Dam spillway at 35,000 cubic feet per second for the last four days, California Department of Resources engineers has been able to get the water level behind the dam back down from the danger level of 670 feet to 662 feet. But operators still worry that running the compromised spillway increases dam safety risk. With farming in California consuming about three-quarters of the 40 million acre-feet of water used in California each year, agricultural water districts hope to be able to pump about 15-million acre feet of water back into their underground aquifers this year. But that is just a small amount of the up to 1-billion acre feet of fresh water that California aquifers can hold. It will take several wet years for water to naturally percolate down the 50 to 500 feet depth of most groundwater wells in California, according to the U.S. Geological Survey.